The Rio Puerco valley of the East has had a small proportion of human occupants with recent years and by the ceramic evidence available it is supposed that there was a small number of occupants living in the valley in prehistoric times. The earliest inhabitants probably entered the valley prior to channel trenching and surface denudation and possibly maintained small fields through flood water farming. The ceramic evidence implies that there have been frequent group movements through the Rio Puerco area, thereby revealing the valley to be a migration route through which many different groups passed from early to late times. The migrations probably took place as early as 800 A.D. and varied in their intensity through 1700 A.D. In the former case the aborigines moved by some influences unknown to archaeology; in the later years, especially in the Historic era, the movements were due to the conflicts between the Indians and the Spaniards. 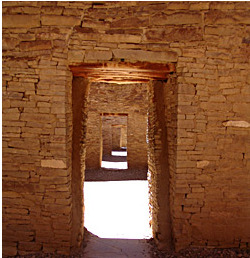 The pottery stages, i.e., Basket-Maker III to Pueblo IV are found in the Rio Puerco in varying amounts. In addition the pottery types are altered from their true form to give hybrids in painted wares and in glazed wares, at the same time retaining the original form which is not exceed in numbers by the hybrid forms.